pH balanced and hypoallergenic washcloths. 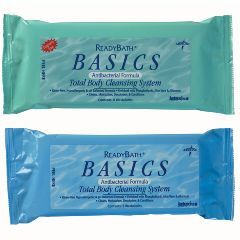 ReadyBath improves skin care by eliminating harsh soaps, washcloths and towels that are known to damage the skin. It contains special moisturizers that improve skin condition. Lightweight. Safe. Easy Storage. Thick and soft. Sturdy. I am 76 years old and have arthritis which often limits my mobility. The bath clothes are very useful at such times. I like it that they're strong, thick and effective. I can even bath in bed if I'm ill. Convenient. Ensures cleanliness. Avoid skin breakdown. Good size. Very moist. Pleasant fragrance. Anytime, anyone, anywhere. Easy to transport. Following Surgery. Elderly. Emergency. Diabetic. Multiiple illnesses. Great person!. Striving to improve. Big on self-help.